I couldn't help but notice how former Governor Jim Doyle made Mike Tate's case for another term as the state Democratic Party's chairman. Doyle said Tate "has really understood what modern politics is. He has understood the media side, the consultant and polling side of it, the money-raising side of it and the really focused data politics." Is that really all there is to modern politics? Doyle went on to say that Tate "has really been able to bring all that together, and he has become a very good leader of people." Does bringing all that together really amount to leadership? If political leadership has come to mean nothing more than doing what the consultants and pollsters tell you to do, raising money nonstop, assembling sophisticated digital voter files and spinning the media, then it is all vessel and no cargo. A representative democracy is built on a simple premise: Those who govern need the consent of the governed. Win the most votes, get power. Earn public approval of your actions, stay in power. But no politician wants to give up power, so every politician's worst fear is losing an election. That explains the lengths to which politicians will sometimes go to make sure they win elections even when their policies fall out of public favor. In Wisconsin we are witnessing a step-by-step march to nullify the consent of the governed as a condition for governing. Step One: Manipulate the political boundaries. Once every decade, congressional and legislative district boundaries are redrawn to take into account population growth and shifts in where people are living. If one party fully controls the government when this task is to be done, there is a seemingly irresistible urge for that party to pack large numbers of its opponent's voters into a few districts and scatter the rest across the many remaining political jurisdictions. That creates an opportunity to win the most seats and hold onto power even when you are unable to win the most votes. 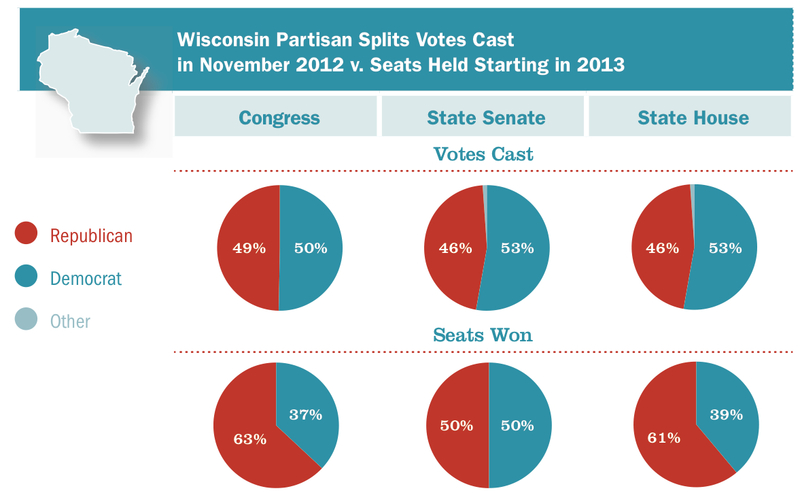 That mission was accomplished after the 2010 census by the party in power in Wisconsin through partisan gerrymandering, and produced the desired effect. Step Two: Suppress the vote. If some group of citizens is more likely to vote for your opponent, election rules can be manipulated to either put up formidable hurdles that these voters must clear in order to cast a ballot or disenfranchise them altogether. Just such a law was enacted in Wisconsin in 2011, in the name of fighting voter fraud. Thing is, of the few cases of voter fraud Wisconsin has seen, not a single case has involved the one form of fraud this law could possibly prevent. That's the telltale sign that the law really aims to permit governing without the consent of the governed, not combat election fraud. Before it could work its magic, this law ran into a hurdle of its own, namely the language in Wisconsin's Constitution spelling out the right to vote. New legislation has been drafted in hopes of working around this pesky constitutional obstacle and re-erecting the barrier to voting, while restricting early voting to boot. Step Three: Rig the money game. In addition to making it harder for some to vote, the legislation also opens the door to more campaign contributions from lobbyists. The bill, which might as well be called the "Govern Without Public Support Act," also removes language from state law that was put there in 1905 banning corporate election spending. That law was rendered unenforceable for the time being by the 2010 U.S. Supreme Court decision in the Citizens United case. But no ruling this unpopular with the people will stand the test of time. With the party currently in power in Wisconsin overwhelmingly advantaged by corporate election spending, that party's desire to cement the legalization of this kind of electioneering is understandable. Just as it was understandable that the party in power rammed through a law in 2011 that caused the opposition party's biggest financial supporter, the state teachers union, to scale back its campaign contributions from $2.3 million for the 2010 elections to just over $946,000 for the 2012 elections. When Citizens United finally succumbs to public opinion and is overturned, the party in power doesn't want a law on the books prohibiting corporate election spending that can once again be enforced. Again, that would breathe new life into all that consent of the governed business. Step Four: Conceal the money power. When politicians are trying to rig the rules to enable them to win elections even when they are losing public support, the last thing they want is for people to be able to readily see how they are doing it. That's why the Govern Without Public Support Act also assaults disclosure of campaign finances. It writes the "magic words" loophole into state law and nullifies disclosure rules approved in 2010 by the state Government Accountability Board. Meaning that interest groups would have state law's blessing to keep the public in the dark about who's paying for campaign advertising aimed at influencing state elections. Avoid using words like "vote for" or "vote against" in political ads, keep the money secret. This legislation needs to be seen for what it is and what it would do . . . the next phase of an all-out assault on democracy being waged on multiple fronts to subvert the idea that those who govern can do so only with the consent of the governed. An eye-opening article in New Yorker magazine tells the story of how public television backed away from its commitment to fund a new documentary film titled "Citizen Koch." Readers learn that the politically meddlesome billionaire David Koch has given public television $23 million, and don't have to read between many lines to come to the understanding that public television cooled on the project in hopes of appeasing Koch. It's always galling to see a news organization compromise its journalistic principles in the face of financial or political pressures. It's especially painful when you consider that the plan was to air the film on the PBS program "Independent Lens." I know "Citizen Koch" well. I was interviewed at length for the project and appear in the film. It made its debut at the Sundance Film Festival in Utah at the beginning of the year and got its first screening in our state at last month's Wisconsin Film Festival. With public television pulling out, the movie's producers have to find other ways to bring it to audiences. That's where you come in. You can watch the trailer and organize a screening in your community. While you're at it, you might consider contacting the PBS ombudsman who is billed as "as an independent internal critic within PBS (who) reviews commentary and criticism from viewers and seeks to ensure that PBS upholds its own standards of editorial integrity."